Getting to the root cause of roof water leaks and then finding a solution to the problem is no easy task. Solving roof water leaks can involve not only waterproofing methods but also include solving associated structural issues. Being both a registered builder and a waterproofing specialist throws a different light on the complex problems of water ingress. Lack of understanding about roof structural construction can lead to rectification decisions that may not actually resolve water leaks. I have witnessed the diagnosis of roof water leaks as a waterproofing membrane issue, when in fact, it turned out to be a plumbing problem or structural design element. In these cases, unfortunately installing a new membrane does not solve the problem - many times you are back at the start all over again however with a financial outlay that was wasted. "SOLVING ROOF AND BALCONY WATER LEAKS IS NOT JUST ABOUT WATERPROOFING"
First, there needs to be what I call ‘water forensics, roof assessment or investigation’. Water can track a considerable distance from the original point of entry. This needs to be determined prior to works starting. Using a concrete roof as an example - water may track underneath the existing failed sheet membrane and find its way out to rooms below. Inevitably the entire rooftop may require a newly installed robust membrane - not just the area of water leaks. Concrete leaching due to water leaks from roof above. So, the big question: how do you decide on the correct waterproofing method to solve roof leaks? Selection of the correct waterproofing materials is a tough decision particularly as there are so many different types and broad range of products to meet market demands. I would not be so bold as to suggest there is any one product for roof restorations, in general they all reasonably good - otherwise they shouldn’t be on the market. In my experience, it is a combination of choosing quality waterproofing products together with correct roof rectification methodology that will "pay off" in the end. Rigid or semi-flexible type of waterproofing product. Often used for internal areas. Being cement based, these products are not flexible enough for the contraction and expansion of the normal roof process. Most commonly used sheet waterproofing materials are self-adhering rubberized asphalt membranes. Main advantage of sheet membranes is their consistent thickness. However a higher in-place cost is one of the main disadvantages of sheets. The cost of the material itself is likely to be greater on a square-foot basis than the liquid membranes. Labor cost is also higher, because of all the cutting, handling, reinforcing, and detailing you have to go through during installation. This is a seamless and joint free process. Most important benefit is there is significantly no chance of seepage of water unlike in roll sheet WPM and other water proofing methods. 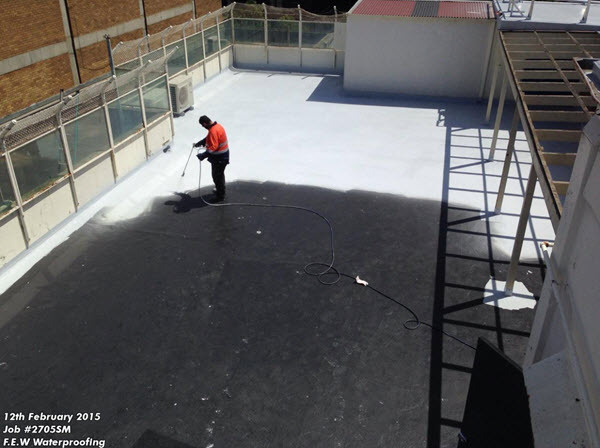 Spray Applied - Waterproofing Contractors can spray over a larger area in a day - up to 3 x times faster than other waterproofing methods. 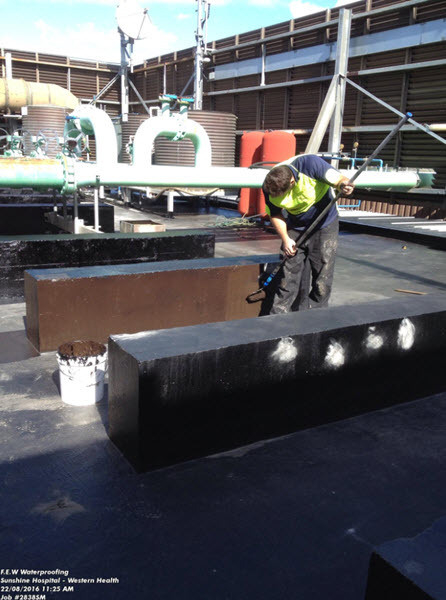 Findlay-Evans Team use Liquid Applied Membranes for all roof waterproofing projects. 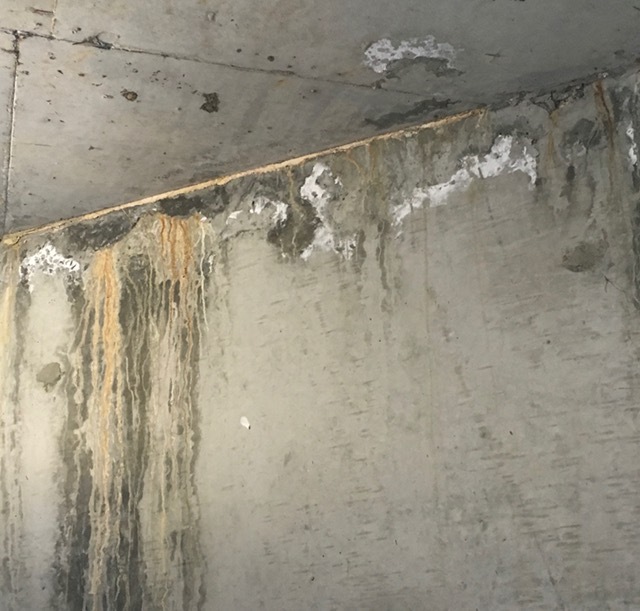 A frequently asked question in regard to rooftop remedial waterproofing: ‘can the existing surface be re-coated, or does the damaged membrane need the costly and time-consuming option of total removal’? Often when we are called in to rectify a leaking roof, we are dealing with older buildings with a membrane at the end of its life cycle. These roof membranes have been patched up over many years to stem intermittent water leaks, although eventually it becomes unviable and unmanageable to keep spending money on fix ups. There comes a time, when money on roof rectification must be spent and spent well. 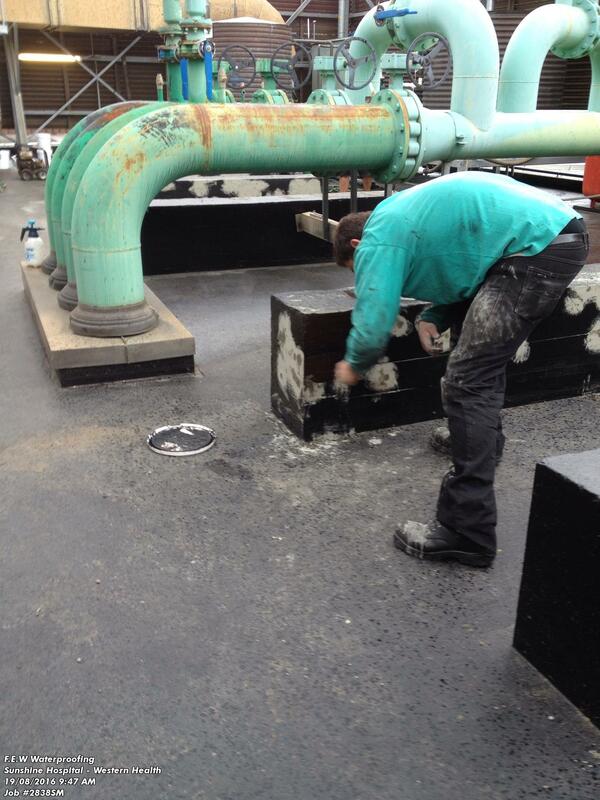 Liquid Waterproofing can be spray applied under, around and over existing surfaces and structures. This is particularly relevant with "busy roofs", such as those with mechanical installations and rooftop plant deck equipment. Such equipment is logistically difficult and costly to remove and re-install and will also involve intrusive down time. 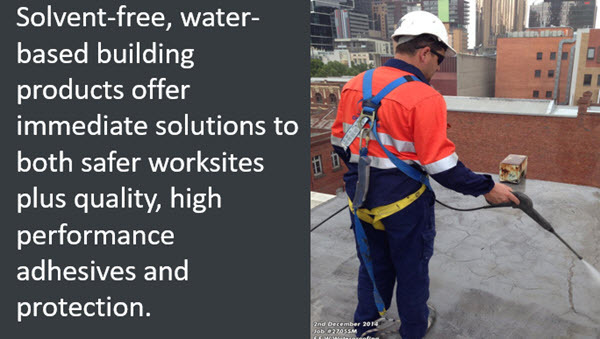 Equipment mobility & access is particularly relevant for existing concrete slab roofs. Seamless waterproof membrane which is ideal for roof applications. Can be applied over existing failed sheet membrane systems. Liquid Membranes are up to 750% elastic to expand and contract with the roof surface. Suited to all common types of industrial roofing: concrete, metal, corrugated iron, aluminium & timber. Applied directly with no priming, offers a 100% waterproofing formula and outstanding adhesion. Cost effective and versatility makes Liquid Applied Membranes one of the most sought after waterproofing materials in the roofing industry.